An ITEC-qualified massage therapist, Sandi also holds current certificates in Hawaiian Lomi Lomi and Deep Tissue Massage Therapy. She bases her treatments entirely on how the individual feels physically and/or emotionally on any given day - and this can vary a great deal. 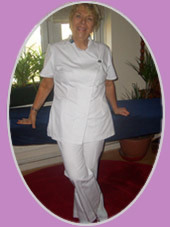 "After one of Sandi's treatments, I feel both relaxed and invigorated - crucial to my condition. I also always leave feeling so much more positive and supple. And this spills out into my environment with my family and friends as well!" Sandi is fully insured with Balens and holds a current YMCA First Aid certificate.